Here we have a forlorn group of birders that clearly do not trust each other. Good December to you birders. I hope you are all busy doing some post-Christmas/Chanukkah/Festivus birding, and heeding my advice about not going on pelagic trips. This month I would like to share some alarming news with you…although I hate to say it, the evidence is conclusive, and it cannot be ignored any longer: all birders under the age of 35 are terrible. It’s true. In case you are one of those crazy loner birders, I’ll let you know that birders are big gossips. HUGE gossips. They are very chatty. They love talking about strange birds, rare birds, missed birds, birds whose origin are suspect, birds that could show up someplace, the weather, and of course…other birders. Especially bad ones. And now, after years of interviewing them, I have come to the final conclusion that all young birders are suspect. None of them are very good, and seem to have even more glaring personality flaws than their elders. At least, that is what The Kids tell me. How do I know this? I have many sources in the birding scene. Each <35 source can name almost every <35 birder I’ve heard of and mention how unreliable they are, without me even needing to ask. I suspect this even includes the venerable Seagull Steve, who is of course the Number 7 birder in the entire nation. All of this comes as a surprise, and it just doesn’t add up for me. I’ve found that a lot of the up-and-coming birders I know are pretty damn good in the field. But who am I to argue with a whole generation? Dickcissels seem to be one of the many species young birders are not capable of identifying correctly. Recently I was birding with several younger birders at Point Reyes, California, one of the best birding spots on the west coast, as far as vagrants are concerned. We were at a particular spot to view a Dickcissel, which had been there for some time. A <35 birder named “Matt Brady” had just seen the bird (or so he says), and felt it was his duty to notify some other birders who were present. 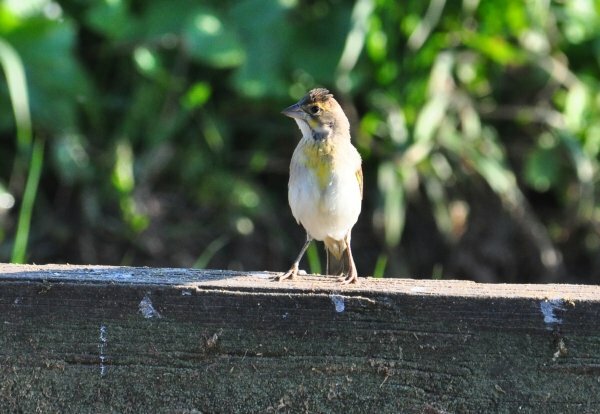 He approached a random, older birder, and told him the Dickcissel was just up the road. What did the senior birder do? He completely ignored Matt Brady, and then walked the opposite direction from where Matt said the bird was being seen. Clearly, this man knew to not trust anyone in the prime of their life. Someone must have told him about this “Matt Brady”. Of course, there is the alternative possibility that all young birders talk trash on other young birders to make themselves look good in comparison. But there is no reason for this…right? Are birders really that insecure? Maybe I just answered my own question. What is the moral of this story? Speak kindly of your fellow birders. It’s the season for good will toward men (and women), after all. Don’t gossip too much, because that sort of thing will come around to bite you in the….well, you know where. And for all you tenured birders…do not assume someone’s age is any indication of their skill. Where other birders would falter, and potentially slip into a coma, I’ve seen “Matt Brady” bird his way successfully through the flock. The kids are alright. Love it – particularly as today is my 35th birthday! I’m relieved to know that I will be able to start birding tomorrow and actually identify birds that I see. My life list is definitely getting reset to 0 as those first 250 or so were clearly aberrations of a deluded young mind. From this day on I look forward to all of my bird relating pronouncements receiving the rapt attention of fellow birders, family members, coworkers, and random strangers on the street. @Calgary Birder – I am glad you have come to terms with how fruitless your past has been. Welcome to the golden years! Dammit. I thought I wasn’t supposed to trust birders under 30. You’re telling me I have to wait a few more years to be taken seriously? I’m sorry Nate, people over 30 have also been ruthlessly targeted. I recommend lying about your age…that includes to yourself. Wow those are some seriously forlorn birders. Will making a Kurt Cobain just dying joke make me appear older or younger than 35?? @Jen – Maybe stick to Jim Morrison? I’m a 16 year old birder myself, and I have found myself in the exact same situation. I was birding in the San Francisco Bay Area and I posted on eBird my sighting of a Vermilion Flycatcher. I received an e-mail saying that’s impossible and that my sighting will not be posted. I send the lady who sent me that e-mail pictures of the birds, and concludes that I found the first Alameda county record of a Vermilion Flycatcher. So yea, the kids are alright. I have found some way around this, to a degree. First, if you’re not yet a common name in your local birding area, ONLY BIRD ALONE for maybe the first year. Let no birder see you. During the first year, post plenty to the local chapter’s online list/group while concealing all personal information, especially your age. Then, suddenly, show up at a walk or meeting. Introduce yourself. All the older birders will crap bricks upon realizing they at times got schooled online by a young’un. @Lindsay – That’s a great plan, and one that I have successfully implemented in the past.